Nexus phone releases are timed to let Google have the last word - and what a way to have it! A phone that matches any flagship on specs and premieres the latest OS version, but costs barely half as much as some of them. The Nexus 5 promises a great finale to yet another exciting smartphone season and it's not only the droids that stand to attention. This could have been a deja-vu moment for everybody but the fifth gen Google phone will probably have to work harder than ever. There's already a bunch of Snapdragon-800-powered Android flagships, while Qualcomm's latest is ticking inside Windows Phone-powered devices by Nokia too and Apple has the new 64-bit A7 chipset. On a second thought, Nexus phones have never been too keen on getting into the skirmish, keeping their distance, aloof and somewhat out of touch, nothing to prove to anyone. The best of Google on your homescreen - that's what it's all about - and at a price that's almost too good to be true. The search giant is partnering with LG for a second year in a row. Whether the Koreans are offering the best production cost or both sides were happy with the Nexus 4, it's a choice we don't mind at all. Anyway, Android 4.4 KitKat on a five-inch full-HD screen, powered by a Snapdragon 800 is a package no one would say not to. Check out the key specs to see what we're on about. Although there's almost no physical resemblance to back it up, the Nexus 5 is based on the LG G2 and that's not a coincidence. The Nexus 4 last year was based on the Optimus G, so history's clearly repeating itself. At least as far as what's under the hood. Otherwise, the Nexus 5 has one of the most understated exterior designs a flagship smartphone has ever had. It's not an attention-grabber like the iPhone 5s, the HTC One or the Xperia Z1, as if wanting to underline that what matters is inside. The latest major release of Android as usual premieres on a new Nexus phone. 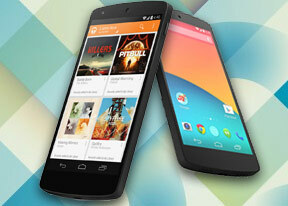 The Nexus 5 runs Android 4.4 KitKat, which brings even tighter OS integration with Google services. There are a number of other improvements and hints at what's to come. But before we get to that, we'll focus on the Nexus 5's build and finish. The Android 4.4. KitKat overview will follow right after, so without further ado, see you after the break. Update, January 24: We heard that the Android 4.4.2 greatly improves the camera so we decided to test it out. Check out page 9 to see how it stacks up against the original 4.4 version.